Ping pong balls fell at the end of a Mr. Moose knock knock joke. Justin time ... for ping pong balls. 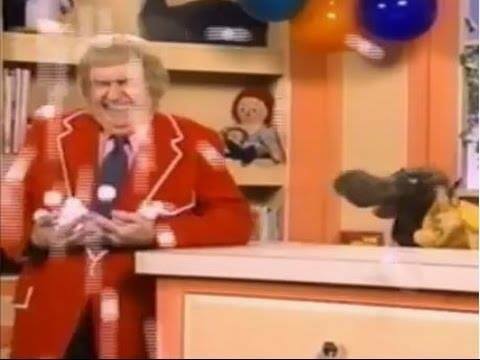 Captain Kangaroo videos remain rare. Maybe someday, CBS will release recordings, if they exist. For now, I hope you’ll post a comment with news of any items you come across. They do not exist. I was working with Bob until the day that he died. Most of the old shows were on tape that was destroyed by CBS. And the PBS shows were not worth keeping.And then the rights were not legally clear since Bob had sold them to create ICM talent. They claimed the rights but they had no clear title to them.Forever lost in the maze of legal miasma. I get lots of questions about videos from the old TV shows, but there is practically nothing available. There are a few things on YouTube. We didn’t have VCRs back in those days, so there are no private collections. Keep wishing. It sounds like the poem The Blind Men and the Elephant, by John Godfrey Saxe. Nope, it's not ringing any bells for me. My mother in law is looking for a book she said CK read in the 80's about and elephant that two things saw and describe two different things about each part of the elephant, ex not sure if it was two other animals would say for ex. his back was broad one say hairy. Hopefully this makes sense to someone. I was born in 1953. I always liked the books he would read, and the song stories, like Angus McFergus McTavish Dundee, and Albert the Airsick Eagle. Does anyone know the book that he would read where they would play the Manhattan Beach March in the background? Seems like it was about a boy who couldn't stop reading a book he'd just gotten. Thank you! I loved Simon. But not many people remember Simon and his drawings. I am so glad I am not the only one to remember the words to the song. Does anybody remember Simon from the Captain Kangaroo Show? He sang a catchy little tune . . . Now you know my name is Simon, and the things I draw come true; you can take me, take me, take me climbing over the garden wall with you. How do we still remember this stuff?! Captain Kangaroo is mu favorite television series! Actually, it was more than a series...it was a visit with my favorite television friends! I own some 16mm film kinescopes, which are incredibly difficult to locate. I've hear an unfounded rumor that videotapes of the series are located in an underground salt mine. We continue to honor Bob Keeshan to this day for his tireless and sincere work for decent children’s entertainment. Those of us who were children in the 70s or earlier, and who remember watching the Captain’s show as children, now have children of our own. My own kids are young adults. We who remember that type of programming need to remind programmers that decent entertainment still has a place. While brash programming has its attraction for kids, young children are not necessarily looking to be smacked in the face all the time, and they"d be happy with gentler shows if only those shows were programmed and if only families tuned them in. In retrospect, there are things I would change about the daily life in my household during the 1990s when my kids were young. But without a doubt, we tried to avoid certain types of TV programming, and we were successful to a degree. My kids experienced different types of entertainment in different places, but at home, there were certain shows that we watched. There were shows that my kids were not allowed to watch, and that resulted in some discussion, but overall, the kids enjoyed the decent programming that we could find. The 2006 controversy over VeggieTales adds to the frustration for the decency movement. If you don’t want your kids to be exposed to religious messages, OK, but only a small minority of American parents are concerned about that. Considering that kids are inescapably bombarded daily with obscene programming and ads, it’s just stunning that NBC would censor generic religious statements from a show like VeggieTales that is widely lauded for it’s positive themes. The networks can handle the publicity resulting from a naked Janet Jackson or Desperate Housewife during a football game, so it's hard to believe they can’t handle the VeggieTales issue. It’s not specifically ping pong balls or grandfather clocks that make Captain Kangaroo important. The important thing is that kids can be entertained and morally educated in a gentle way. When the Captain’s show ended for the day, you weren’t motivated to beat up your sister; you ran down to your buddy’s house to play. What is a kid motivated to do after a half hour of Ren and Stimpy splattering boogers all over the screen? Hurrah for the Captain.